This huge arrangement is the crème de la crème of arrangements. If you are in A LOT of trouble, or you really want to make an impression at that next meeting, this is for you! 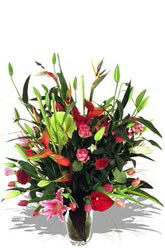 Lilies may be sent closed/partially closed in order to prevent damage and to last longer.If you wish to make a fantastic impression, may we suggest that you add the Superior box of chocolates to this already amazing bouquet! Wow! The flowers arrived in a timely manner, and having seen photos of them, I'm thrilled with them, as is the recipient. 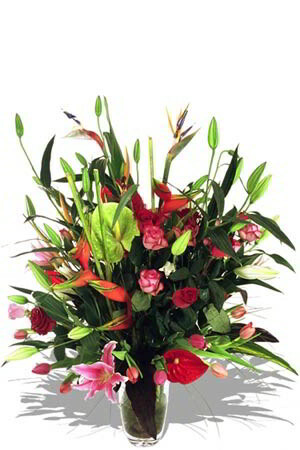 The flowers were delivered on the day requested and the recipient said they were beautiful. She sent me a picture showing that the flowers were lovely with maybe a few replacements as the website indicated could be a possibility. I asked her if I should order from your website again, and she gave a two thumbs up. A well designed ecommerce experience, great product selection and timely delivery. Hi, We received the picture of the bouquet and it seems to be smaller than what we were expected... Thanks. Excellent service and product thank you!! !